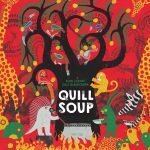 Is there a better way to start the new year than by introducing you to a book which will take you somewhere you’ve likely not visited via picture books before, is illustrated by the first Asian recipient of the most prestigious awards in children’s literature, the Hans Christian Andersen Award, and is about to be published for the first time in the UK with its original illustrations? 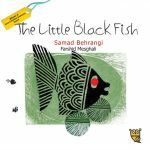 The Little Black Fish written by Samad Behrangi, translated by Azita Rassi and illustrated by Farshid Mesghali is perhaps the most famous children’s book of all time back in its home country, Iran. 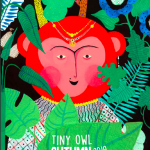 As anyone who’s spent time with children knows, the littlest people can ask the biggest questions, and so it is with the little black fish in this story who wants to find out more about life outside of the pool where he and his family have always lived. Just because the family have always lived a certain way, why shouldn’t this brave and curious fish extend his horizons and set out to explore beyond his known world? As the fish travels downstream he sees incredible sights the like of which he could never before have imagined. He also faces some terrible dangers. Will the fish survive to see his dream – the wide open ocean? Will his story of inquisitiveness and desire for freedom inspire others? 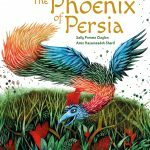 Behrangi’s story took on great political significance in Iran after it was published, read by many adults as a political allegory (you can find out more here). Indeed the message was so powerful, the book was banned in pre-revolutionary Iran. 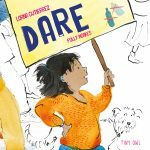 Whilst this historical background gives the book an additional charge for adults, younger readers in 2015 can enjoy this short story as an encouraging tale about believing in oneself, about learning from personal experience, and about not being afraid to be different.